Bitcoin isn’t coming. Bitcoin is HERE. Is The Global Financial Apocalypse Drawing Nigh? What will the world be like after Bitcoin has taken over completely? 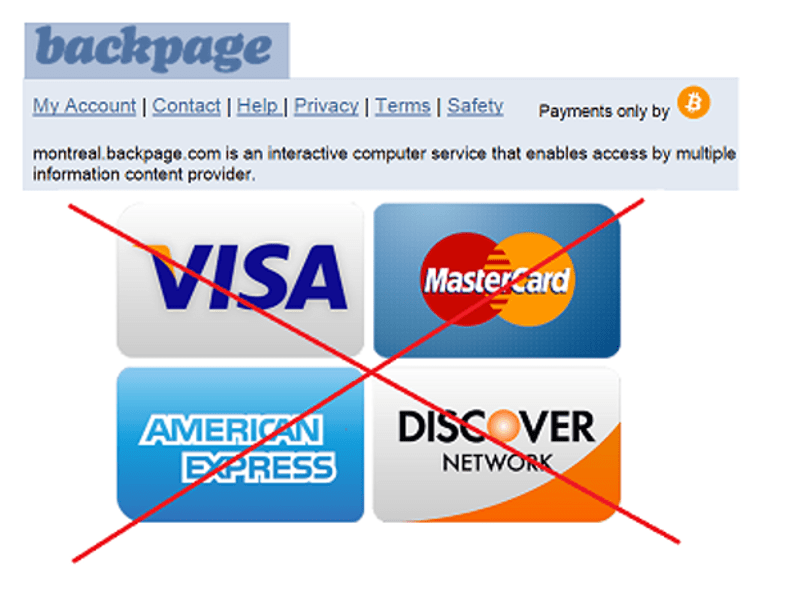 Backpage.com no longer accepts any other payment than Bitcoin? What the hell has happened? I went to renew an ad I had looking for more wedding photo jobs on Backpage.com and there’s a message saying that since July 6th they’ve stopped accepting VISA as a form of payment. MasterCard, Discover, all the other cards are apparently out of the food chain as well. Now the only way you can pay is with Bitcoin! Yes, Bitcoin: the same ephemeral internet currency based on basically nothing but good faith that shady characters used to acquire drugs and the illicit services of hitmen on the darknet with. Now it looks like the whole internet is beginning to go the way of Silkroad. Any transaction issued with Bitcoin cannot be reversed, they can only be refunded by the person receiving the funds. That means you should take care to do business with people and organizations you know and trust, or who have an established reputation. For their part, businesses need to keep control of the payment requests they are displaying to their customers. Bitcoin can detect typos and usually won’t let you send money to an invalid address by mistake. Additional services might exist in the future to provide more choice and protection for the consumer. Bitcoin is an experimental new currency that is in active development. Each improvement makes Bitcoin more appealing but also reveals new challenges as Bitcoin adoption grows. During these growing pains you might encounter increased fees, slower confirmations, or even more severe issues. Be prepared for problems and consult a technical expert before making any major investments, but keep in mind that nobody can predict Bitcoin’s future.